Well well well it’s ended up a dryish week, a few days rain at the start but nice and dry from then onwards. This dry spell will certainly make the Plants and weeds grow a bit more. It’s been a mixed week for me here in Hampshire, my middle girl managed to break her leg badly on Tuesday, so a few extra days off than planned happened. During the quiet times, it was good to get into the garden potting stuff up, expanding beds and generally planing a few things out. The garage is slowly beginning its 3 yearly tidy up. It’s only a tiny garden here in chandlers ford but it is one I love a lot. So anyway on to the six this week and yes they all do come from my little patch, so I hope you enjoy them! A few of you may remember from a few weeks ago, this spotted laurel was on my list for removal and it’s now gone! Got some more roses and hardy geraniums to replace in its spot. Potted up a small fruit tree I am going to train into a odd shape, idea what yet but that comes in time. The dwarf Buddleja is another that’s on my list to repot and is now done! Crafty: sneaking in more plants of the week! Your opening gambit is a real wow-factored tulip which has gone on my want list for later in the year. Damn! You slipped in some primulas as well. I need another course of inoculations, I think! Will you have more than one flower per bulb with the Fritillaria uva vulpis? Are they less flowering than F. Meleagris? In any case, it’s a really nice one ! Don’t know which of your Six I like best, although I’ll put the buddleia on the bottom of the list. Not that I don’t like them, but it’s easily #6 because it’s got such stiff competition. That tulip is just . . . wow. No wonder you love your garden w/all its delights. Hope your daughter is out of pain & doing better, although she’s got a bit of time before she’s off & running again, poor thing. Poor parents as well! 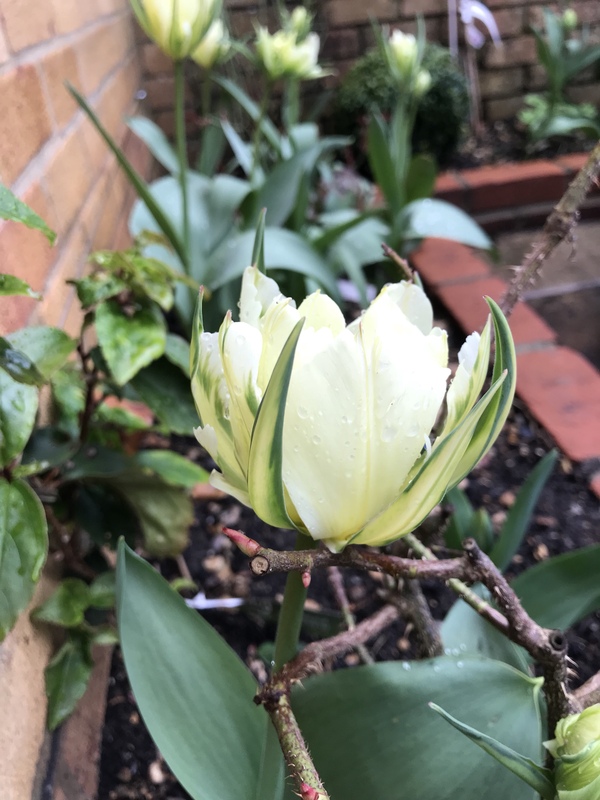 Wow some gorgeous plants this week – love your elegant Exotic Emperor tulip and having enjoyed some modest success with Fritillaria meleagris you’ve got me thinking it might be time to move on to uva vulpis. Hope middle daughter’s leg doesn’t take too long to mend! What a great 6. Loving that tulip! So elegant. That tulip is fab! Love a tulip. Is that a fig tree? Did it grow from seed? Some of mine came from seed, even though I was always taught to not let them grow from seed. Wow that tulip at the top is gorgeous, will look out for that one.